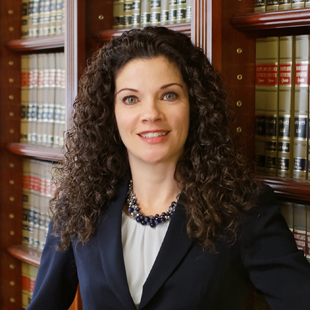 Rebecca A. Fleming, Esq., a partner at the law firm of Turnbull, Nicholson & Sanders, P.A., was installed as the 100th president of the Baltimore County Bar Association (BCBA) June 21. In addition to being the BCBA president, Fleming is secretary for the Maryland State Bar Association, Family and Juvenile Law Section Council, a member of the Harford County Judicial Nominating Committee, has been appointed by the Court of Appeals to serve as a member of the State Board of Law Examiners Character Committee and is a board member of the Baltimore Carroll Chapter of the Women’s Bar Association as well as numerous other organizations. She has been a member of the BCBA since 2002 and chair of its Young Lawyers Committee in 2005-2005. In addition, she is a current member of the Law Day and Family Law committees as well as an at-large member of the Executive Council. Prior to joining Turnbull Nicholson in 2014, Fleming was with Bodie, Dolina, Hobbs, Friddell & Grenzer P.C. for 12 years, joining the firm as an associate in 2002 and elevated to partner in 2012. Before that, she was an associate with Kramer & Connolly and a research professor with the George Mason University School of Law. After being installed as president, Fleming outlined her plans to build on BCBA’s successes and one of her first acts was to select a charity for the BCBA to partner with, choosing the American Foundation for Suicide Prevention (AFSP) for the 2018-19 bar year. The BCBA will have fundraisers throughout the year, including a wine and whiskey event, young lawyers bull roast and a golf event to raise funds for the AFSP. Fleming and her husband, Keith, have two children. Rebecca A. Fleming, ., a partner at Turnbull, Nicholson & Sanders, P.A., is the 100th president of the Baltimore County Bar Association. How did you decide on the American Foundation for Suicide Prevention as the BCBA’s charity partner for this year? In 2016 a good friend of my husband and I took his own life. It seemed shocking, but after conducting research and becoming informed about the risk factors and warning signs of suicide, I realized that in my personal life, and especially as an attorney, I frequently come into contact with members of the community who exhibit the risk factors and warning signs of suicide. Suicide is currently the tenth leading cause of death in the Unites States. I was drawn to the AFSP’s focus on research, education, advocacy, and support for survivors of suicide loss and those affected by suicide. If you had not chosen law as a profession, what profession would you choose and why? I have no idea because I decided to become a lawyer at the age of 11 and I never strayed from that career goal. I enjoy all of my vacations with my husband and our two children, but my favorite trip was when we went to Disney World with good friends in June 2017. Disney World is not necessarily my favorite vacation spot, but I enjoyed seeing my kids spend time with their friends there. Unplug from all electronics, including the television, and I read an actual book that I hold and turn the pages of.